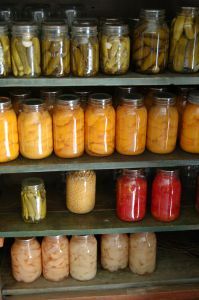 In any type of disaster, survival food storage is a priority, and whether or not you survive will depend on how you handle this. This covers more than just having food stocked away, which is what many people think when they prepare an emergency kit. It also includes knowing how and where to find food if you are low on cash, run out of supplies or food is in short supply. When it comes to food for survival, many aspects need consideration. For those people who live in areas prone to disasters such as hurricanes, floods and tornadoes, foodstuff in cans or those that do not require cooking should always be on hand. Not only that, but in the event of a sudden loss of income, being able to go to the cupboard or pantry to put together a meal is a source of peace of mind; better than worrying about whether you are going to be able to feed your family. Not only is it possible to make and put together your own survival foods, it is possible to buy readymade kits for this purpose. The so-called experts say that survival food supplies should last a minimum of three days per person, which is why you can find fancy 72-hour kits. Unfortunately, most disaster aftermaths can't tell time and don't punch a clock. Ask the victims of Hurricane Katrina how long they went without food and water before the government rode to their rescue. Ask some people who lost their job six months or a year ago, and are still out of work, how much food would have been enough. When it comes to survival food storage, couponing is not only a fiscally responsible way to ensure that you have food for your family; it's just plain smart. Gone are the days when couponing was just something old ladies did. Now it is a very important tool in saving money and ensuring that food and other essentials can be available. By combining coupons with sales, and hopefully double and triple couponing, you would be surprised at how much food you could accumulate. If you want to do your own canning or food dehydrating, check out Freecycle.org for what people are giving away. You'd be surprised at how many Mason jars people give away. Also, check thrift stores and garage sales for pressure canners and food dehydrators. For very little output, you can begin "putting up" your own food. If money is not an issue, you can invest in long-term storage food, most of which comes in #10 cans and 5-gallon buckets. This freeze-dried and dehydrated food will last anywhere from 20 to 30 years when kept in ideal conditions. Everyone. Ideally, it would be nice if everyone were aware of the need and importance of survival food storage, and even more so, how to prepare everyday food for storage. Those who understand the value of having a supply of certain foods in stock are on their way to mastering the art of self-preservation. Unfortunately, too many people are willing to let the government take care of them. Others don't believe it could happen to them, and would rather spend any spare cash on fancy clothes, vacations and toys like boats and ATVs. Others, especially those who live in rural areas, have made it their business to know most of the wild foods for survival in the outdoors. Getting lost in the woods for days without food can mean certain death, plus, eating poisonous plants and berries can cause serious harm or even death. Knowing what is safe is a big step in being prepared for survival in the outdoors. These days, when no one is sure that they will have a job from one month to the next, it makes sense to buy items that can keep for months or years. This is the best way to be sure of being able to eat for a while, whether or not you are earning an income. The peace of mind from not having to worry about having enough to eat can be a blessing in times of financial crisis, with an added benefit that many people are able to help the less fortunate with items from their survival food supply. The current famines in many countries across the globe and fears about food security are also good reasons to start being prepared. Learning all the techniques necessary for successful survival food storage is important. No matter how much foodstuff is in storage, if it is not stored properly, spoilage will be a problem. Preparing for any kind of food emergency means more than just putting a few food items away in the event of a disaster, it also means being able to consume it when any type of food shortage occurs.